So you are getting more enthusiastic about cycling as a hobby and a sport. You have upgraded your bicycle into better materials, invested in good cycling gear or maybe you are on the road to training. Since you have put so much time, effort and money on your vehicle, you would like to use it as much as possible. In addition, you are also probably thinking about bringing your bike with you to weekends or out of town trips. If you’re going to be cycling, you’re probably going to be transporting your bikes from time to time. For most people, this means purchasing a bike rack for their vehicle. Sounds easy enough, right? True, bike racks are pretty simple and straightforward…but only if you have the right bike rack for your needs. 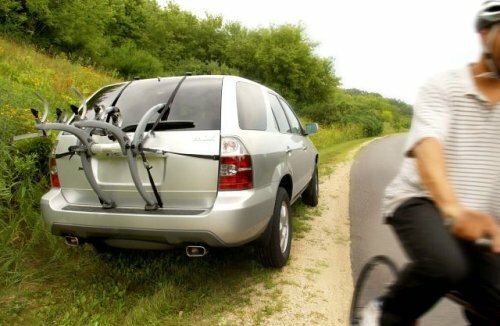 A poorly-fitted bike rack can mean damaged equipment (or worse, if a bike falls off on the highway). And choosing a rack that’s inconvenient to use can mean more hassle and less desire to ride. 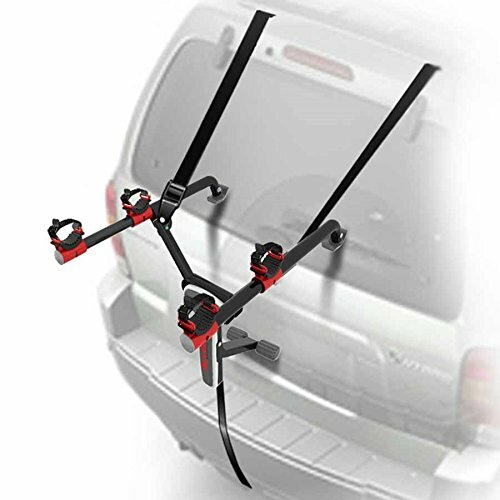 Let’s see how to choose the best bike carrier for your SUV or car and where to look for bike racks for sale. How often will you use the bike rack? How many bicycles will you be transporting? Will you need to switch the racks between vehicles? How important is bike security to you? Up to what height can you lift the bike all by yourself and hold it with one hand? 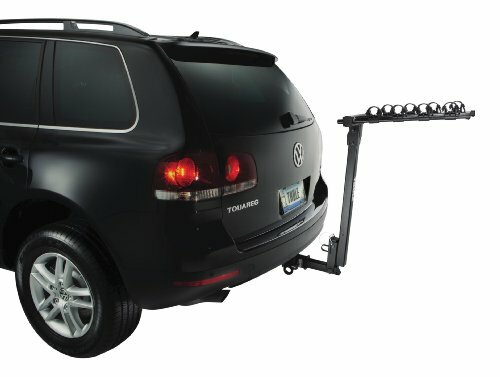 Does your vehicle have a roof utility rack or tow hitch? Does your vehicle have mounted spare tires that could interfere with mounting? Do you have other sports or activities? How many bikes, and what type, do you need to carry? Some racks can hold more bikes than others. 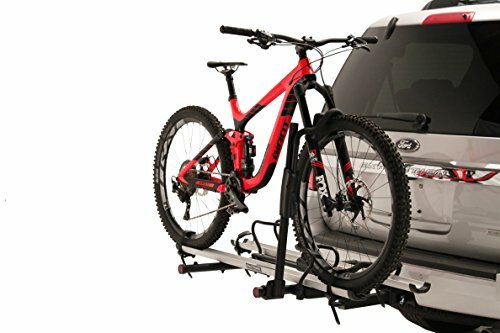 Hitch mount racks will typically hold more bikes – up to 5 – as well as trunk racks – up to 4 bicycles. 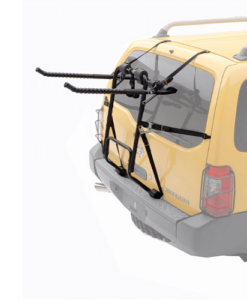 Other rack styles will generally only accommodate one, two or three bicycles, like roof racks or spare tire carriers. 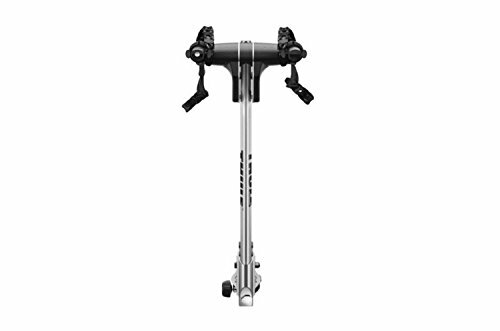 As an example, Hollywood Racks HR1400 Sport Rider SE can hold up to 4 bikes and it can accommodate any bicycle style while Yakima FrontLoader can hold 1 bike only. In addition to the number of bikes, it’s helpful to consider what type of bikes will be hauled. A lightweight carbon road bike can be lifted to a roof rack without much trouble, but heavier mountain bikes could be less convenient. 2. Does your vehicle have an existing roof rack or rain gutters along the roof? Installation of a roof rack requires either factory roof crossbars or a rain gutter. 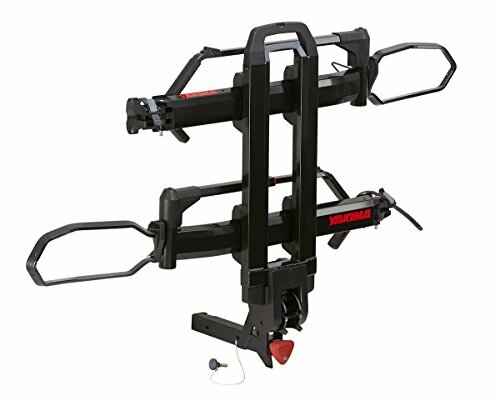 Even small roof racks like the Yakima ForkLift need something to attach to. 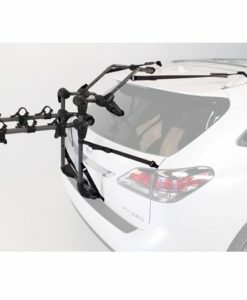 When you don’t have a factory roof rack to clamp on to, systems like the SportRack Complete Roof Rack System use a car’s rain gutters to attach. 3. Does your vehicle have a trailer hitch? 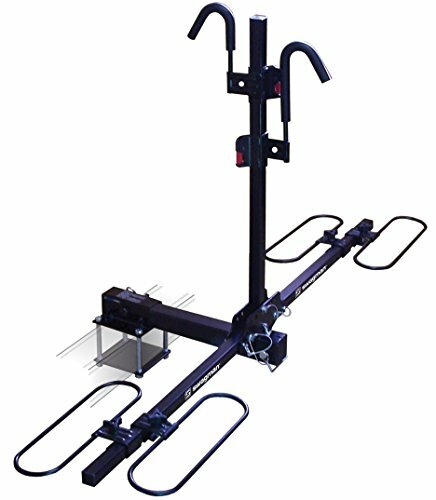 A trailer hitch allows you to mount a number of different rack systems. These have the advantage of being lower to the ground and easier to load an unload. There can be various types like platform style hitch racks (tray-style), hanging hitch racks or V-shaped and so on. 4. Does your vehicle have a rear-mounted spare tire? 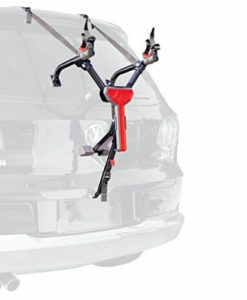 Spare tire racks that bolt on, such as the Yakima Sparetime Bike Rack are typically very secure and easy to set up. 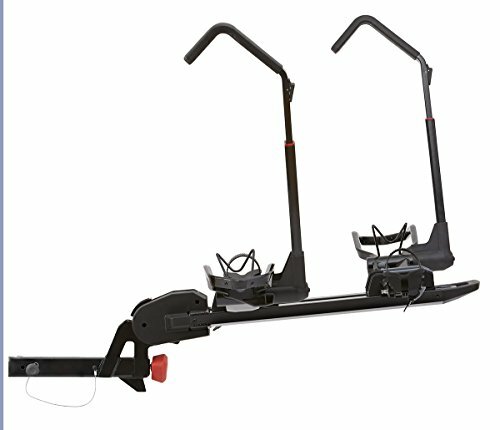 There are also models that use friction hangers and straps to mount to the tire, although these are harder to install. 5. Are there road/driving conditions to consider? 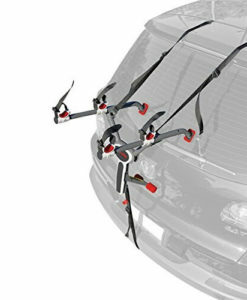 Different racks will change aspects of your vehicle’s drivability. 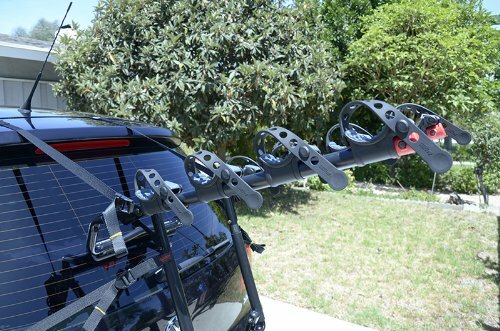 A roof rack laden with bikes will create aerodynamic drag and often reduce gas mileage. It also changes the clearance of the vehicle, making it hard or impossible to go through drive-thrus or park in a garage with bikes loaded. 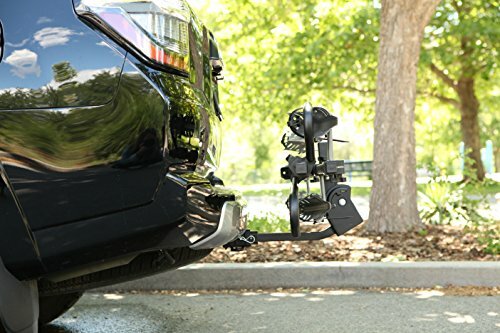 Rear-mounted racks create less drag, but it should be noted that trailer hitch racks usually ride low to the ground which can pose problems when driving in rough terrain. 6. 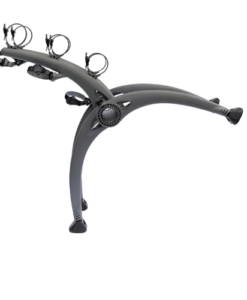 How much are you planning to spend on your bike rack? As with most products, the cost is a factor. There is a myriad of options and styles, each offering their own advantages and drawbacks. 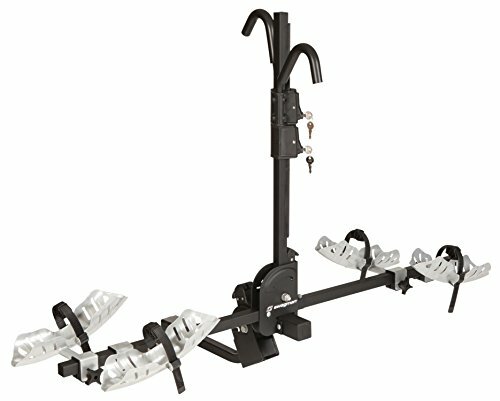 For a simple, budget-friendly trunk rack, the Allen Sports Premier 4-bike trunk mount carrier is quite popular. 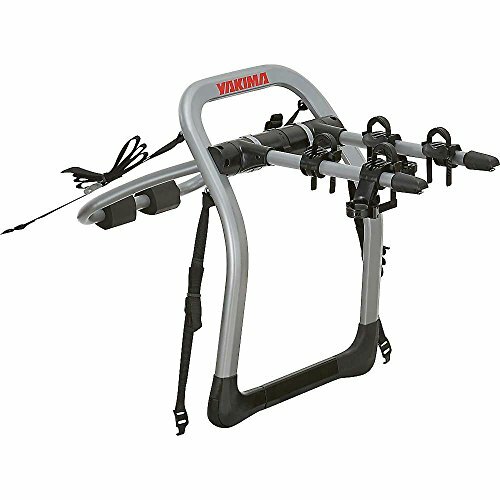 For single-bike roof racks, the Yakima HighRoller rooftop bike rack is among the best available for vehicles with existing crossbars. 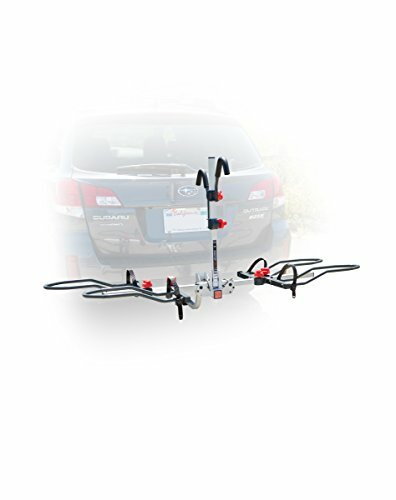 Hitch bicycle racks come in various sizes that match the class of hitch that a vehicle has. They are easy to install, easy to use and you have low chances of ruining your car’s paint while mounting the bikes. The cons of this kind are the tendency to block license plates, difficulty to lock bikes, not recommended for special bikes and the probability of blocking the rear view mirror. 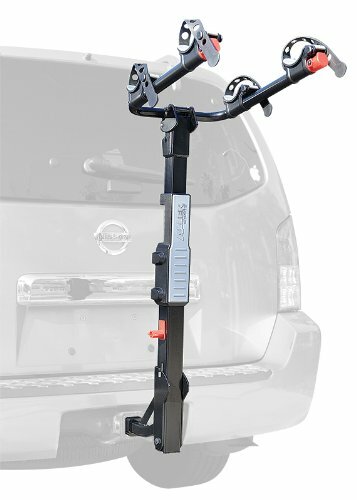 Read more about hitch mounted bike racks. You’ve probably seen trunk racks more often than any other type simply because they’re easy to match up to most cars. 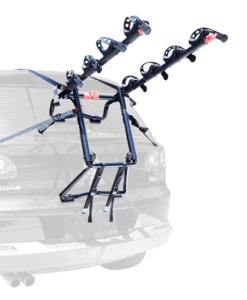 Whereas other racks require things like roof crossbars, trailer hitches, or spare tires to mount, a trunk rack only needs a rear hatch or trunk. Can limit access to your trunk/rear hatch in many cases. 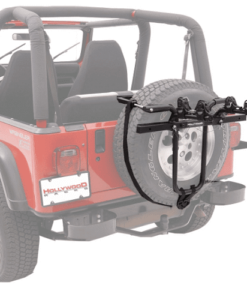 For the sake of argument, we’ll call racks that mount to a spare tire or a trailer hitch a “rear rack,” and you can choose either depending on which mounting point you have access to. Hope all of this information helped you decide what would be the best option for you. 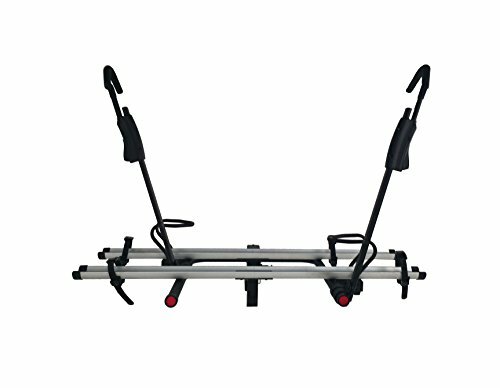 Now it’s time to see some styled and top-rated bike carriers and buy the best one that fit your needs. 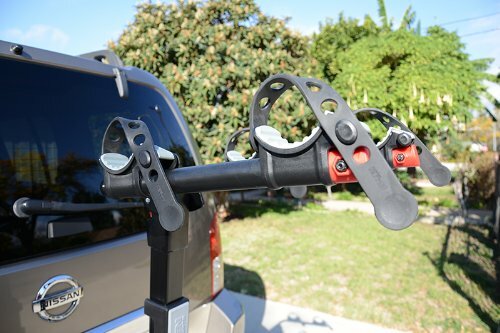 This entry was posted in Best Bike Carriers in 2018 and tagged best bike racks, sale bike racks. 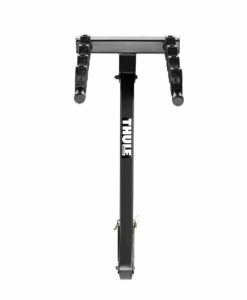 I like how you mentioned that trailer hitch bike racks take advantage of being lower to the ground and easier to load and unload. I am not very tall, so finding a bike rack that I can reach and is comfortable for me to use is pretty important. 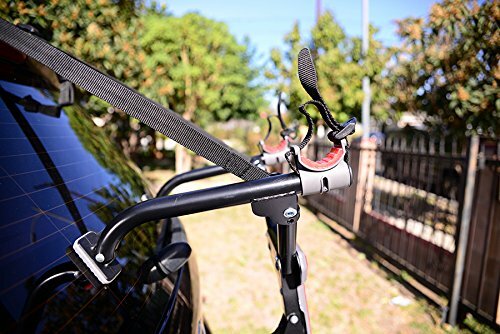 Thank you for the information on the various types of the bicycle rack, like platform style hitch racks and hanging hitch racks.